What a rush. After a decade of banishing brass and most gold-toned lighting from every house and condo, we’re seeing gorgeous gold finishes rise like the sun. Finally! I have come to think that regardless of trend if you love a color you’ll want to live with it. And not every color works well with the chrome and nickel craze we’ve experienced for more than 15 years. And there’s the bronze metals trend, but here too, not every color responds to bronze. I think what broke our allegiance to chrome and bronze was the velvet craze. 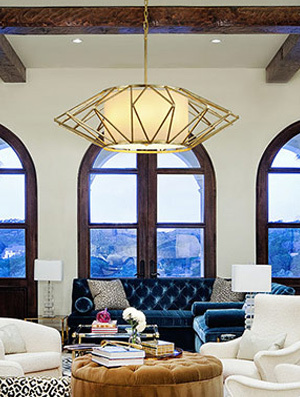 The gorgeous jewel toned velvet upholstery in teal or deep ochre is a natural with gold lighting fixtures. The photo featured here centers a massive velvet upholstered ottoman under a fixture that reminds me of the sun. Imagine that amazing fixture in nickel or oiled bronze. It just can’t crown that room the way Calliope by Troy does. Feel free to break away from the trends and seek your own Zen. If you love a color and want to use it in a room, it’s good to know that we have the lighting that truly highlights it. Sunshine. We need more.